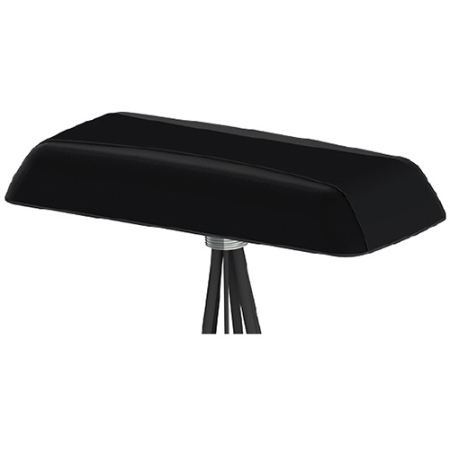 Mobile Mark’s LLP702 Series Multiband Diversity/MIMO antenna contains five separate antenna elements, all in one compact antenna housing: two broadband LTE/Cellular antennas, four dual-band WiFi antennas, and one GPS antenna. The LLP702 covers Cellular LTE frequencies from 694-3700 MHz. MIMO (multiple-input-multiple-output) modems for both WiFi and LTE/Cellular offer greater speed and capacity than earlier generations of modems. They achieve this by sending RF signals on multiple antenna elements to maximize the amount of information transmitted and received. To ensure optimum performance, the systems need multiple antennas on both the transmission and receive ends. With seven elements, the new LLP702 antenna is ideal for fleet management systems that combine GPS with both an LTE 2x MIMO modem as well as a WiFi 4x MIMO Modem. Measuring 9” (22.8cm) x 3.5” (8.9cm) with a low profile of 1.25” (3.18cm), the LLP702 series antennas take up significantly less space than multiple antennas. The radome is available in black and white . The antennas can also be configured for combined GPS & Glonass use. This antenna is available as a mag-mount.